July BarkBox Review: It Got Our Tails Wagging! Albie’s BarkBox came and was greeted with enthusiastic tail wagging and happy sniffs. We missed June (I was on vacation and my husband let Al tear into it before remembering to take pictures, which is a shame, because apparently it had some monkeybutt toy), but feel free to go back through the archives and check out May’s review. We have gotten this subscription for a year and we love it! As with most subscription boxes, the longer you sign up for the less it costs. Boxes are customized to your dogs size and chew-desire. Albie is, as you know, both a horse and a super heavy chewer. I love this box because some of his all-favorite and most durable toys have come from this box, and it stops me from buying treats every time I’m at the store because I know they’re coming each month. So what did he get this month? 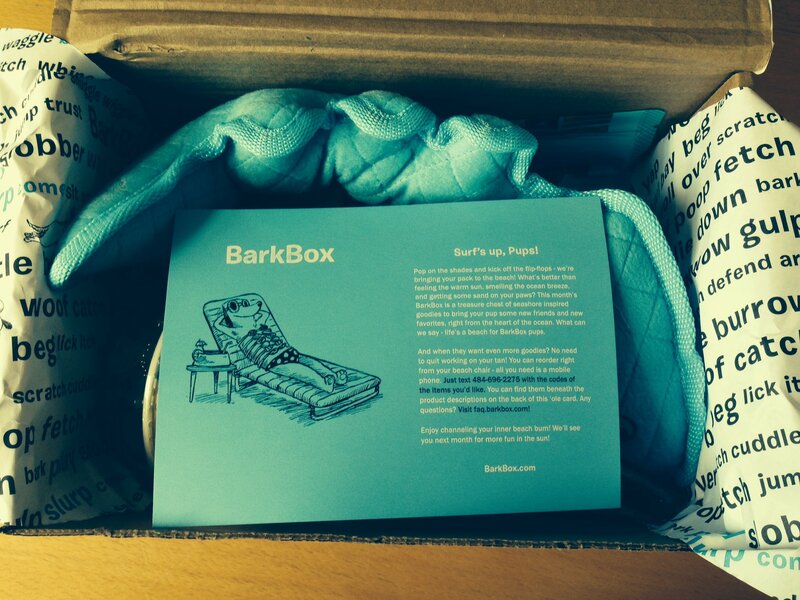 BarkBox has started including prices on the information cards, as well as codes to reorder items your pooch may love. This is very cool, and a feature I have taken advantage of with some of the better toys. Bixbi Daily Essentials Chicken Breast Jerky Treats: USA made and free of wheat, corn, and soy, these are packed with not just chicken but also veggies. Albie is a huge fan. 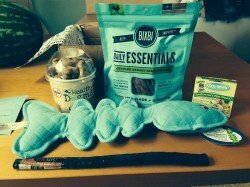 ( http://shop.bixbipet.com/collections/daily-essentials/products/bixbi-daily-essentials-chicken-breast-jerky ) $10 value. Healthy Dogma Coconut Flavor Barkers: these I found on Amazon for almost $14 ( http://www.amazon.com/Healthy-Dogma-Coconut-Barkers-Treats/dp/B00JK30ZZI ). Again, all natural ingredients and made in the the USA. Barkbox says these are worth $8 so I’ll split the difference and say these are a $10 value. Etta Says Duck Chew: oooooh, we love etta says duck chews here! These have come in the box before but they are always welcome. These are things that I will pick up from time to time in a pet store but they are actually really hard to find. ettasays.com, $4 value. I think I paid around $18 a month when I signed up, so a $41 box is obviously a great deal! 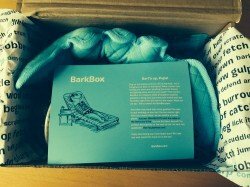 Do you get BarxBox? Would you like to?